The CAGE system, like the similar CAGED system, starts with four of the most common open position chords: C, A, G, and E. Almost all guitar players learn these chords first. They are pictured below. The red squares are roots and the dotted black squares are fifths. (If you're new to the concept of roots and fifths, you'll read a description of them below. 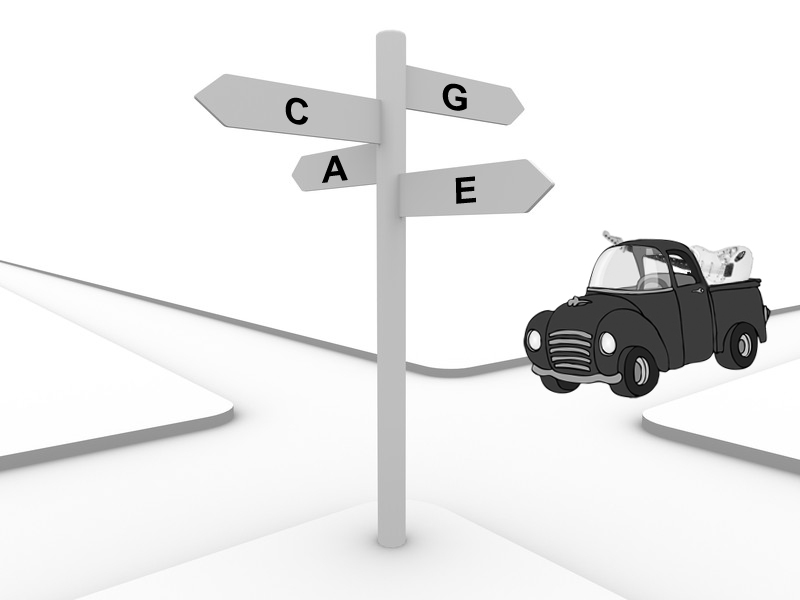 We've just covered the chords in CAGE: C, A, G, E. Next up on our list of the uses of the CAGE system are arpeggios. Arpeggios use the notes in a chord but they're played in succession, not at the same time. These will look much like the chords shown above, with a few added notes because we generally play all available notes of the chord. This means that we may find two notes on a single string (sometimes more for other kinds of arpeggios). The chords C, A, G, and E are called triads because they include only three different letter names. For example, the members of a C chord are C (root), E (third), and G (fifth). A C chord arpeggio is usually played using all of the available members, one-by-one in a row, sometimes spanning less than an octave (seven or fewer consecutive letter names), equal to an octave(spanning exactly eight consecutive letter names), and more than an octave (a span of nine or more consecutive letter names). Shown below are the arpeggios that correspond to the C, A, G, and E chords. Keep in mind that there are other fingerings for these arpeggios, some of which are easier than the CAGE ones. Notice that I have labeled any roots, thirds, and fifths using the same symbols as the chords above. If you look closely, you will see the C, A, G, and E chords contained within these arpeggio patterns. That's one of the benefits of learning the CAGE system - the similarity of the arpeggios to the chords - though it's important to note that there are other forms for each of these arpeggios, some of which are easier. Last on our list for the CAGE system are scales. Scales are a pattern, usually but not always constructed using consecutive letter names, that follow a specific sequence of intervals. For example, a major scale is always built of consecutive letter names using the pattern 2212221, where the numbers represent the distance between the notes in half-steps. In other words, the distance between the first and second notes is two half-steps, the distance between the second and third notes is two half-steps, the distance between the third and fourth notes is one half-step, etc. Half-steps on guitars are found on two frets right next to each other. (On the piano, half-steps are the shortest distance between keys, in other words, two keys right next to each other such as B and C or C# and D.) Since the chords and arpeggios above are major, the matching scales are also major. (If you want to learn more about chords and major scales please check out this page on this website.) The patterns below are the matching scales for the C, A, G, and E chords and their respective arpeggios. It's a little more difficult to see the C, A, G, and E chord patterns contained within these scale forms, so I have circled the corresponding chord in red. Here the root (tonic) is white while the other notes of the scale are black. Like the chords and arpeggios above, these forms are moveable up and down the neck: whatever pitch the white fretted notes are on, determines the key of the scale. If you move the C scale up the neck (higher in pitch) so that the white circles end up on D's (the white circles in each scale are always the same letter name), the scale becomes a D major scale. This is true for the chords and arpeggios shown directly above. I've packed a lot of information into this web article and onto the sheet below, so you may have to set aside some study time to understand it all. There are many things in this web article that I would have liked to explain in more detail, but to keep this article short, I have chosen to explain them in more general terms. If you are really struggling with this material, you may want to look at the other pages on this website listed above. NOTE: When I created this sheet a few years ago, I did not put the chords, scales, and arpeggios in CAGE order. Instead it's EACG from left to right. 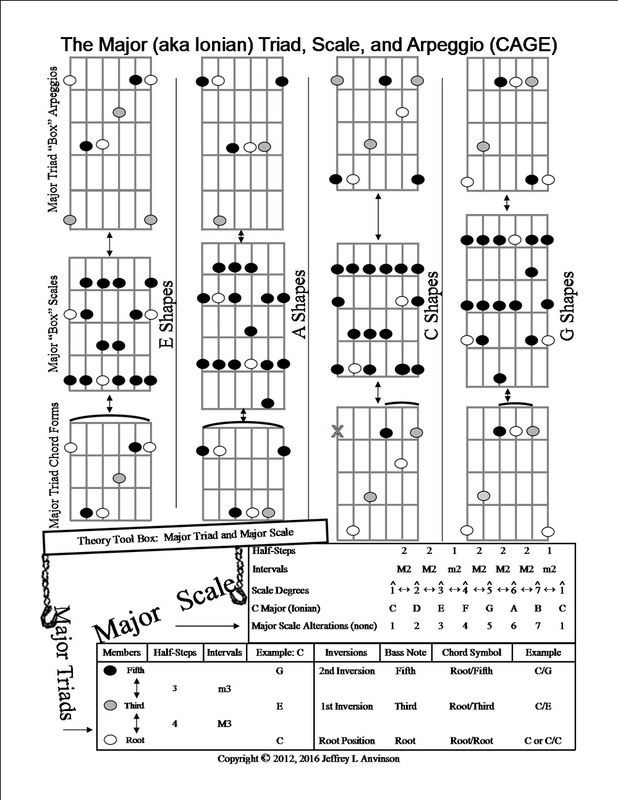 By the way, major scales can also be called Ionian scales: oddly enough, two different names for the same thing. Click here to get a PDF version of this music theory sheet. Please don't distribute this PDF by photocopying or posting it on the internet. You may print out one copy for your own use. If you know someone who wants a copy, simply refer them to this website. Please help me protect my intellectual property by respecting my rights.